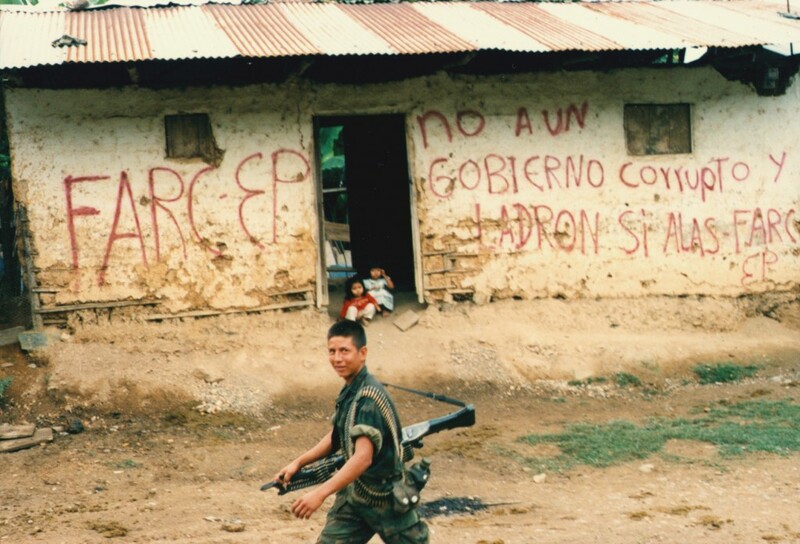 Colombian Army soldier patrolling in front of a house written with FARC slogans in southwestern Colombia. © Photo by Steve Salisbury. All rights reserved. 1) The FARC insists on a National Constituent Assembly (Constitutional Assembly) for ratification of an overall peace accord, saying that Pres. Santos’ planned “unilateral” plebiscite is not judicially nor politically viable as Constitutionally or practically binding, according to the current Constitution, and that the Constitutional Court could strike it down. And even if the Constitutional Court rules it constitutional, the FARC thinks that it still doesn’t give the FARC the strongest guarantees, as the FARC sees a National Constituent Assembly would. That said, Pres. Santos, as a “red-line” condition, rejects a National Constituent Assembly over fears it could turn into a Pandora’s box and put what is agreed to in the peace talks at risk. FARC leaders have told me that they can never have too many protective “guarantees” on not being extradited—one of a number of reasons why they want a National Constituent Assembly. 2) The “ending of paramilitarism” issue. In a recent El Espectador newspaper interview, the FARC’s “Pablo Catatumbo” says that not every single post-“paramilitary”/”paramilitary” individual has to be addressed, but that the government, the FARC insists, has to effectively confront and subdue the “paramilitary” phenomenon, which the FARC says continues in the BACRIM (criminal bands) and other forms. “Pablo Catatumbo” said that the government must thoroughly purge the Armed Forces and police of members supposedly linked to “paramilitarism.” The Armed Forces aren’t going to like the FARC telling them how to run their own institution and whom to purge. 3) Physical security issues. It sounds like this should be handled without making a thorn bush. But after the United Self-Defense Forces of Colombia (AUC) and other “paramilitary” groups demobilized, some 2,200 demobilized “paramilitary” members have been murdered, according to former AUC leader Freddy “El Aleman” Rincon. And the FARC remembers very bitterly the decimation of the Union Patriotica political party which it supported. 4) The form and conditions of “laying down of weapons” (“dejacion de armas”). This is still not decided, and the FARC appears to want to have some sort of putting them in a secured verified “escrow” (if that would be a word of appropriate description) before their eventual decommissioning or destruction, as part of guarantees that an overall peace accord is fulfilled. 5) How to do the gathering of FARC troops in preparation to demobilization of the FARC as a guerrilla movement? The FARC plans to continue to stay organized and mobilized as a legal, unarmed, political, social movement. 6) Resolving the so-called “salvedades”/loose ends (of partially agreed points/categories) left “in the freezer.” Some have philosophical aspects, like “economic model,” which Pres. Santos said shouldn’t be part of the peace talks, or multinational company-controlling and energy/mining issues. The FARC and many other Colombians, including former president/now Sen. Alvaro Uribe, were aghast at the recent sale of the ISAGEN mostly state-owned hydro-electric power company to a private Canadian holding company and only bidder, though Pres. Santos insists on the sale being for Colombia’s good. 7) “Simon Trinidad.” The victims’/justice agreement states that all FARC prisoners are to be released. But US justice isn’t bound by that, regarding “Simon” and other FARC members in US prisons. 8) Details in all points partially agreed. For example, how to provide social, economic and reintegration measures to FARC members returning to civilian society? 9) How to do the judicial frame-work/mechanism for the Colombian Armed Forces/police, which is to be consistent with and respectful of the Special Jurisdiction for Peace, according to the victims’/justice agreement, an item yet to be determined? 10) The uncertainty of FARC members after their laying down of arms and reintegration into civilian society. FARC leaders, mid-level commanders, and rank and file are very concerned for their future. Where are they going to work? Can they make a decent living? Would people in their cities, towns or villages reject them, some even trying to do harm to them? Copyright © 2016, Steve Salisbury, All Rights Reserved.